Jeremiah Owyang, on his blog Web Strategy, recently wrote about Personal versus Career Branding. In his post Jeremiah describes the difference between creating a personal brand and a career brand.As expected, Jeremiah described personal brand as focusing on the individual. Interestingly enough, I thought Jeremiah would describe career brand as developing or helping to develop the brand or the company identity. But he didn't do that. Instead he said that career branding is focusing on what you can do for the consumer. This is not what I had expected at all! It sounds a bit familiar though. Help me here, I'm feeling a little yellow! Today in Fast Track training new agents were introduced to the DOORS Listing System, one of Weichert Realtors greatest tools. It isn't great because of its success rate although that helps generate income. It isn't great because of its customization or the size of the portfolio. The greatness of the Door Listing System stems from the focus of the presentation. It's all about the seller and meeting the seller's needs. WOW! I am encouraged as I hear current marketing leaders write about company values. 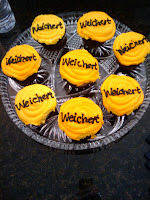 Their ideas reflect the solid appproach that Jim Weichert has been talking about for years. Weichert Realtors' Core Values reflect the foundation of real estate agency, serving the customer. Wayne Murray loves quoting Jim Weichert, "We are not confused." What’s your Social Marketing Plan? Have You Ever Used Google Analytics?